After moving in and getting settled in our house, our plans were to use some of the leftover Richlite from our kitchen countertops to cut a small countertop for our pantry. Well, it didn't quite go as planned and we ended up not having a big enough piece for the pantry. 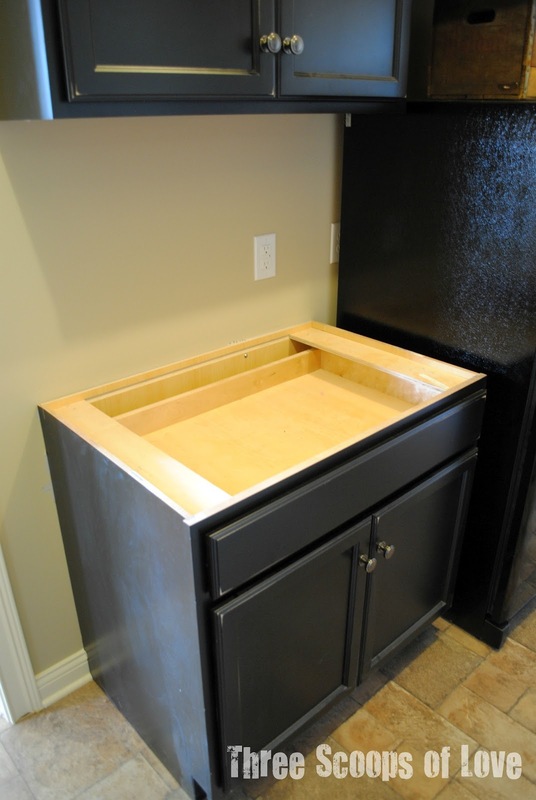 We planned on using this small cabinet space in the pantry as an extra workspace. I wanted a work surface that could be out of sight if we were having a party or something. The space was roughly 24"x36". We thought about just going to Lowe's and ordering a small laminate top, but I then I thought about all of the leftover wood flooring we had from the rest of the kitchen, dining, and entry area. 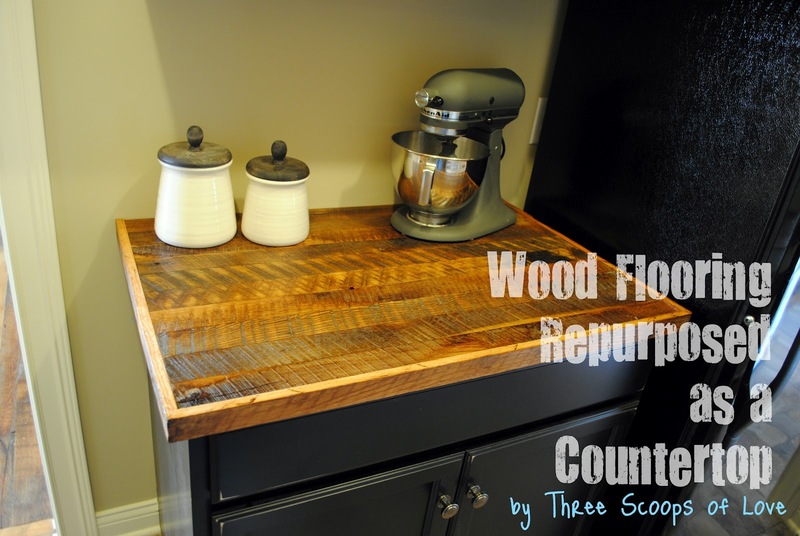 I figured it was worth a shot to make a rustic countertop out of the reclaimed barn flooring. After all, it wasn't going to be a high traffic area, there's not a sink involved, and it was already paid for. I figured that if it doesn't work, I can always replace it with a laminate countertop in the future. I cut my boards to length and made sure they were all even. I sanded everything at this point before it was put together. 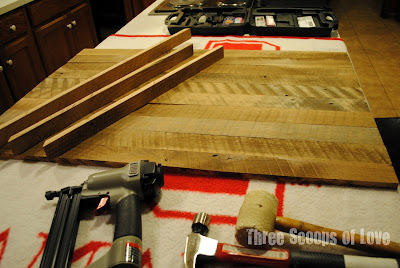 The reclaimed barn flooring is very uneven, so it's easier to sand it in pieces. I used the tongue and grooves edges to snap it all together. 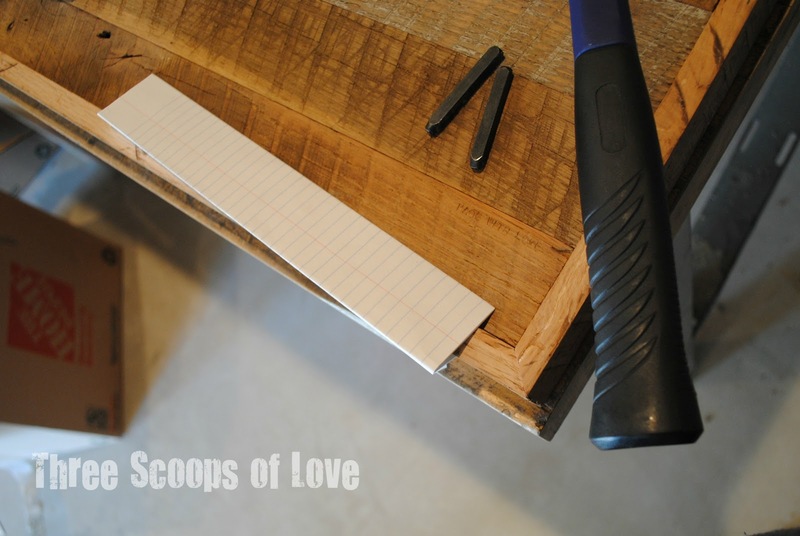 For my edge trim pieces, I cut some of the boards down in width and mitered the corners. I lugged the whole thing over to my parents' house where my dad helped me secure it all together with his nail gun. 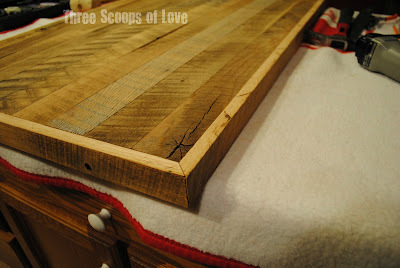 Soon after this, I was perusing Pinterest when I ran across an idea from 3 Sun Kissed Boys to use jewelry stamps on wood. 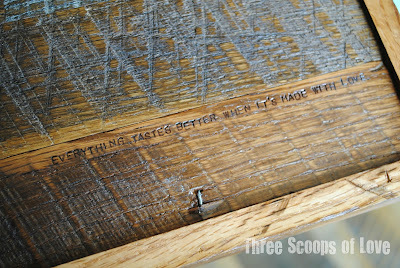 I pulled out a scrap piece of barn wood flooring and started experimenting with my jewelry stamps. I was really hoping to use one of my typewriter style fonts, but they were just too small. The letters got lost once I polyurethaned over them. So, I ended up using one of my larger stamp sets. Wood stamps a lot different than metal! You don't have it hit it as hard and you definitely only want to hit each letter once. I wanted to make sure that I got a fairly straight line for my quote, so I folded up a piece of paper to use as a guide. I would definitely recommend writing your quote or words down on a piece of paper. I was aligning my quote to the right, so I actually stamped it backwards, starting with the last letter of each word. When you're staring at those letters for a while, they can start to look wonky and all wrong, so it's helpful to have it written down. For my stamping, I chose "Everything tastes better when it's made with love." I thought it was fitting for our pantry because I'll see it when I really don't want to take the time to make something from scratch. As I was stamping the words, I kept thinking about one of the first times I came home from college my freshman year and my mom's green beans tasted like the best food I had ever eaten. It's sad that it took some cafeteria food to make me appreciate my mom's effort. Ta-da! 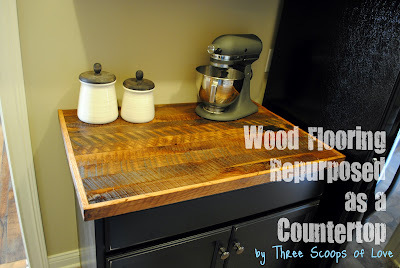 A countertop for my pantry using things that I already had. 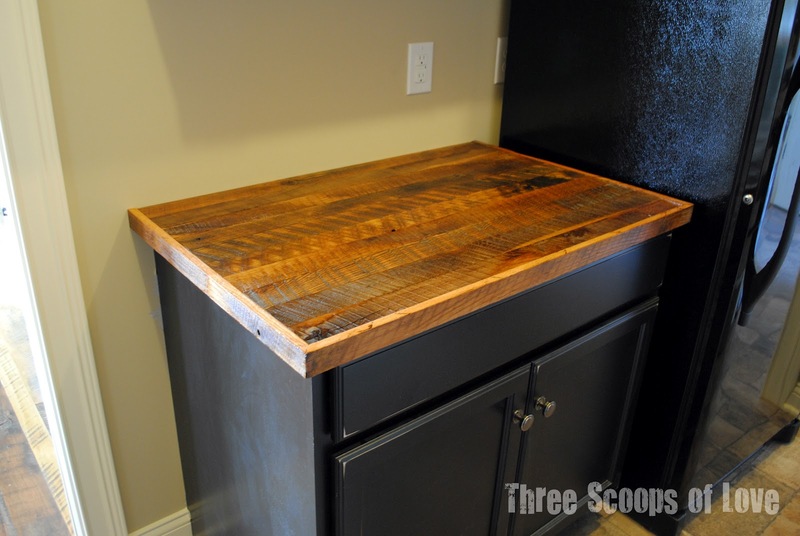 It always makes your project sweeter when you don't have to spend money on it! That is so sweet! Don't you just love customizing pieces. I think it makes us treasure them all the more. The counter top looks fantastic! You can buy an adapter at any good hardware store that will allow a garden hose to connect to the bottom of the utility sinks faucet. Great idea!!! They turned out great!